Is parking a problem in your neighborhood? Do you want to do something for the environment? 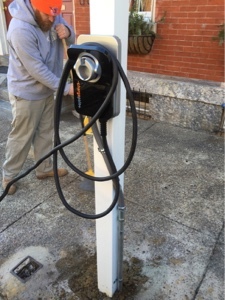 Consider an electric car with curbside charging station. 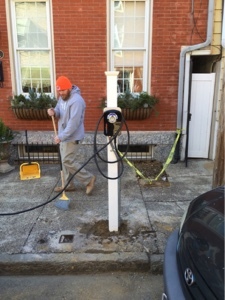 Plug into a greener Philly with GEN3! This was a thoughtful post. It has helped us to think about several technologies that have been introduced with a green concept. We trust them blindly and our governments even invest a lot of money. But many of them fail miserably in meeting its goal. So a proper study should be conducted before adopting any of them. Electric cars are becoming common in many countries. Some have even launched driverless cars. These cars are a good alternative for cars to run on fuel. I hope electric cars will help to reduce the overexploitation of our fuel. In recent days, articles writers are on huge demand. They can either work as a freelancer or under some essay service. They are often paid well for their essays. So many people are able to earn their living from writing. Some of the jobs in which good writers are required are editors, content writers, and copywriters. Apart from all these jobs, blogging is another area that gives good opportunities for writers. Blogs can be based on any topics like cooking, travel, technology, etc. People can create their own blogs based on the topics which appear most interesting to them. They also have the option to write essays for other blogs. Here they are paid per essay they are writing. In blogging, writers should take the effort to make blogs much popular among people. For that content of our post, it should be very good and it should appear interesting to the readers. To become a good writer, we have to become a good reader. All good writers should try to read essays written by other writers. It can be on any topic. We must read these essays very carefully. It will help us to know about the writing styles adopted by different writers.